India Releases Suspect Photos, Blames Pakistani Spy Agency! Members of the radical Islamic Group Lashkar-e-Tayyaba are being sought in connection with the Mumbai bombings on Tuesday. 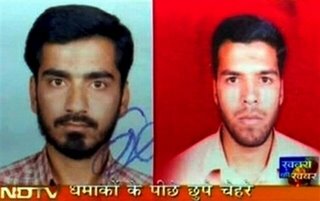 As reported yesterday, The two had been on the run since mid-May, when authorities arrested three suspected Muslim insurgents and seized large quantities of arms, ammunition and plastic explosives after a long highway chase in western India’s Maharashtra state. Bombay is its capital. “We are also certain that these terrorist modules are instigated, inspired and supported by elements across the border without which they cannot act with such devastating effect,” he said. Mumbai police identified another suspect in its bombing investigation Friday, the third man to be sought in the attacks. Police said a man known only as “Rahil” was being sought in connection with the blasts but gave no more details. Also, The Times of India reports… Police say that the tone of the Al Qaeda caller from yesterday sounded like a Kashmiri. Austin Bay has more on the ongoing investigation.